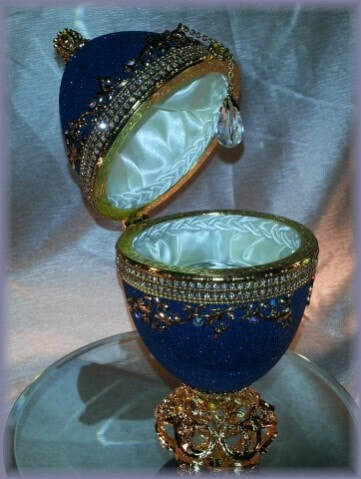 ​A Rhea egg is used to create this stunning blue jewelry box decorated with Austrian crystals and pearls. Decorative filigree is added to finish this unique design. 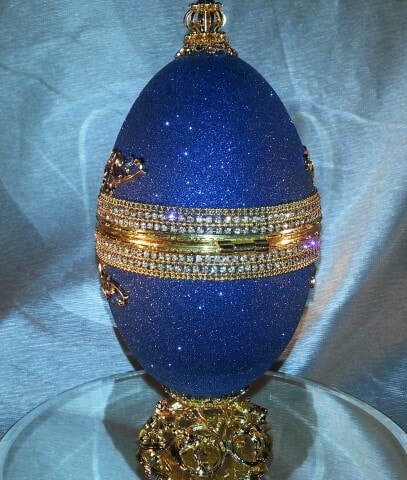 A rich blue satin fabric lines the egg and is completed with a crystal base for a platform. 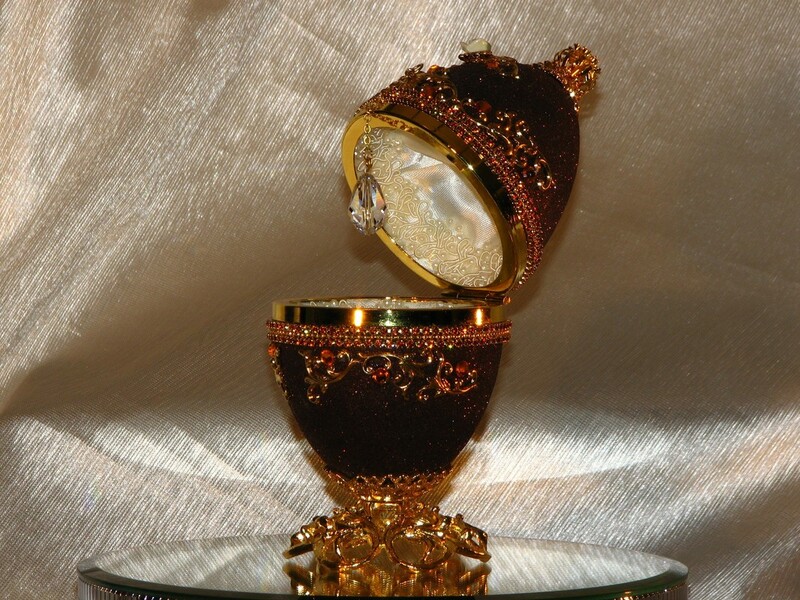 The egg is topped with a crystal filigree top and is supported by a gold plated stand on a decorated Corian base. 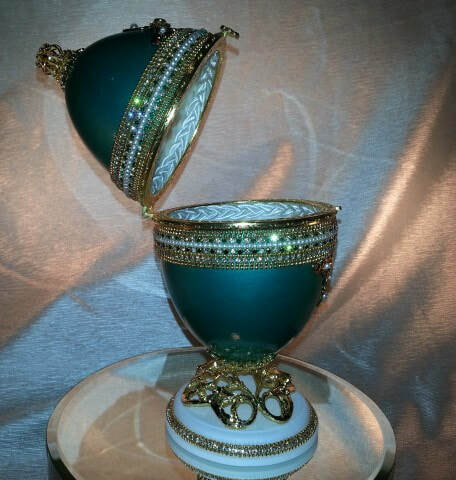 A double yolk goose egg is used to create this beautiful Emerald Green and Pearl string Jewelry box. 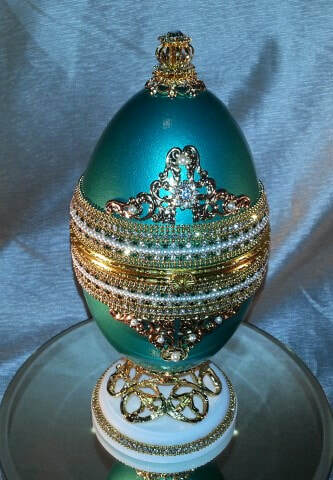 decorated with Austrian crystals and pearls. Decorative filigree is added to finish this unique design. 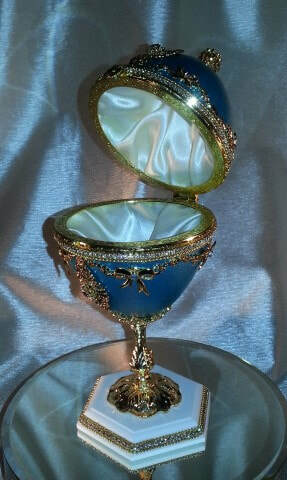 A cream satin fabric lines the egg and is completed with a crystal base for a platform. 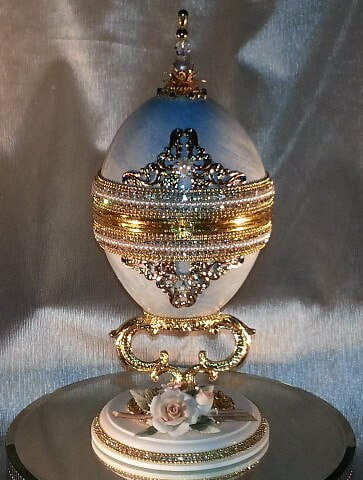 The egg is topped with a crystal filigree top and is supported by a gold plated stand on a decorated Corian base. 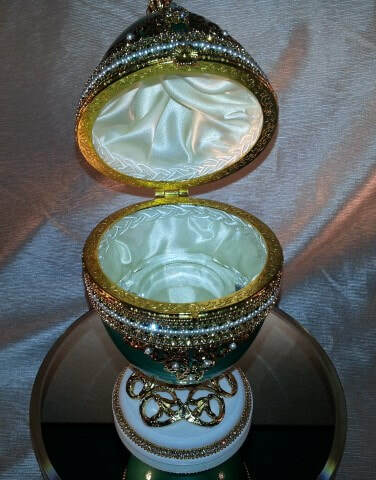 A Double yolk goose egg is used in creating this dazzling jewelry box. 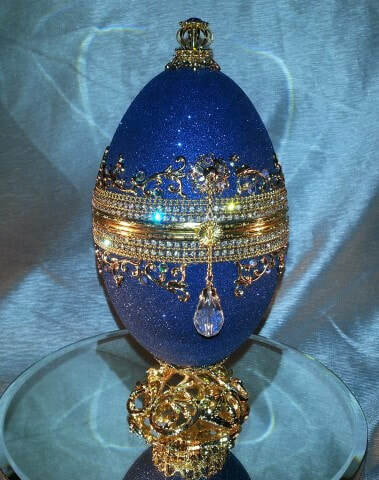 The egg shell is trimmed with a Austrian crystal chain, enhanced with dazzling Blue Swarovski crystals and gold filigree. 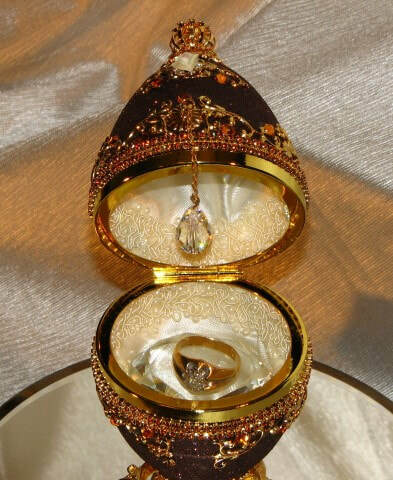 A teardrop Austrian pendant is used to open your jewelry box. 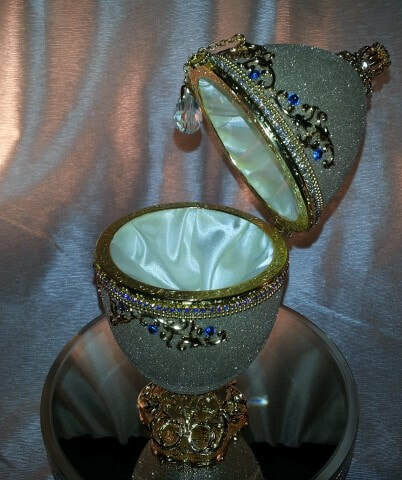 Velvet glitter is used to give your jewel box a feel of velvet. 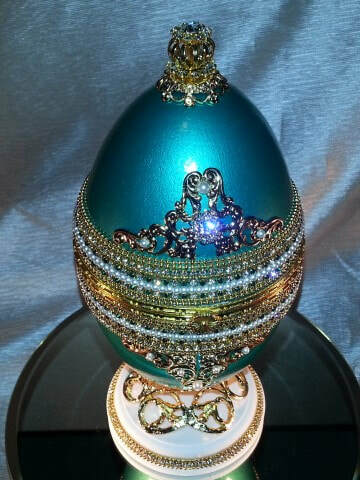 The inside of egg is lined with a cream satin fabric and finished with a lace border on the inside. 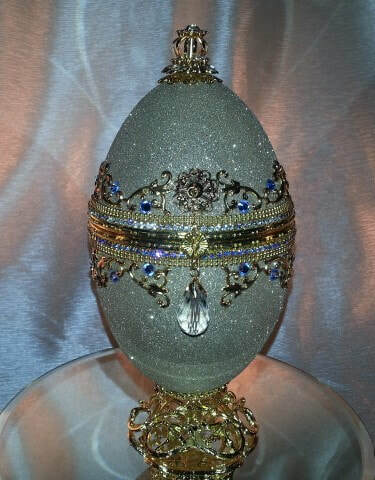 The design is finished with a crystal finial on top of the egg and a gold plated stand to support your egg. 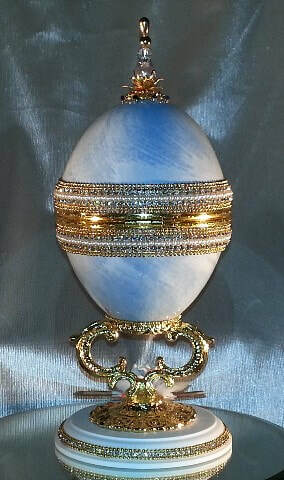 ​A Double yolk goose egg is used in creating this dazzling jewelry box. 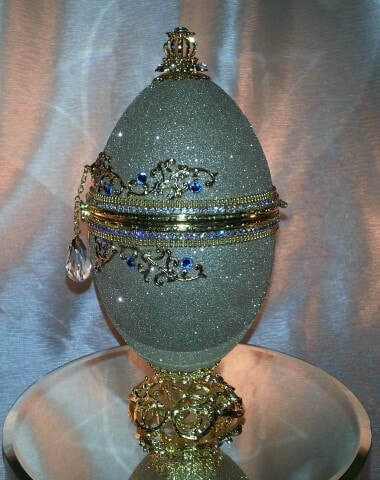 The egg is trimmed with a Austrian crystal chain, enhanced with dazzling Topaz Swarovski crystals and gold filigree. 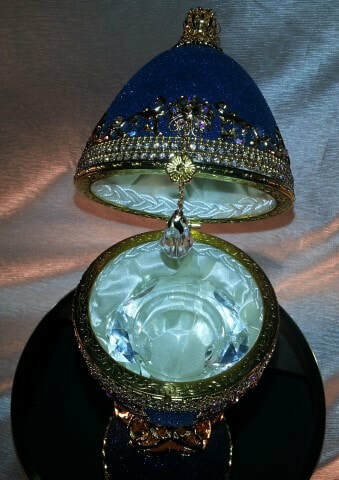 A teardrop Austrian pendant is used to open your jewelry box. Velvet glitter is used to give your jewel box a feel of velvet. 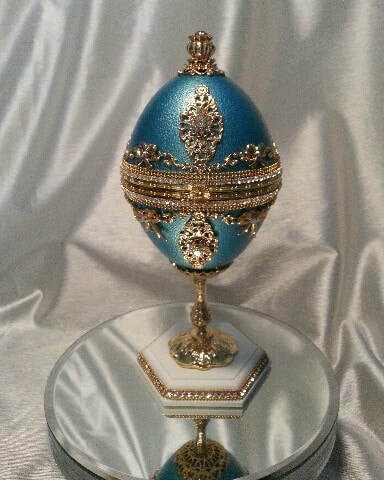 The inside of egg is lined with a cream satin fabric and finished with a lace border on the inside. 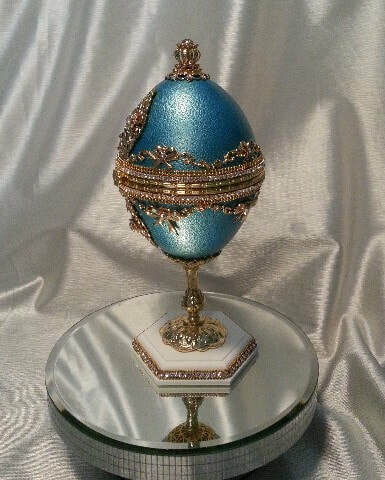 The design is finished with a crystal finial on top of the egg and a gold plated stand to support your egg. 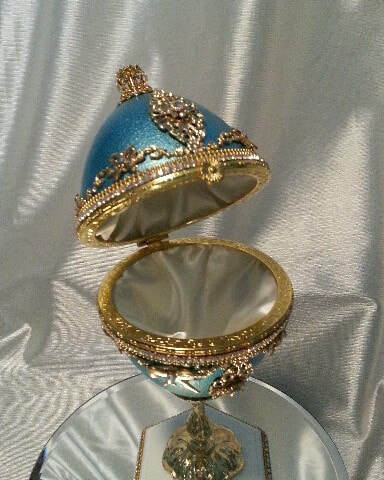 ​A Double yolk goose egg is used in creating this dazzling jewelry box. 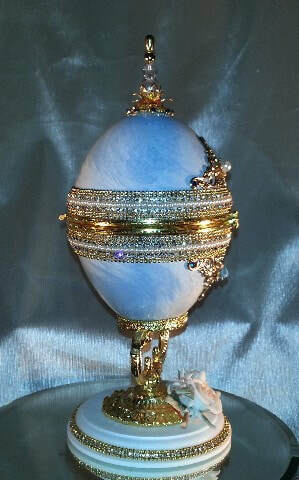 The egg is trimmed with a Austrian crystal chain, enhanced with dazzling light blue Swarovski crystals and gold filigree. 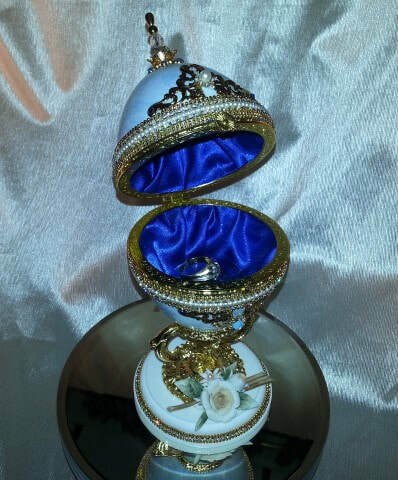 A teardrop Austrian pendant is used to open your jewelry box. Velvet glitter is used to give your jewel box a feel of velvet. 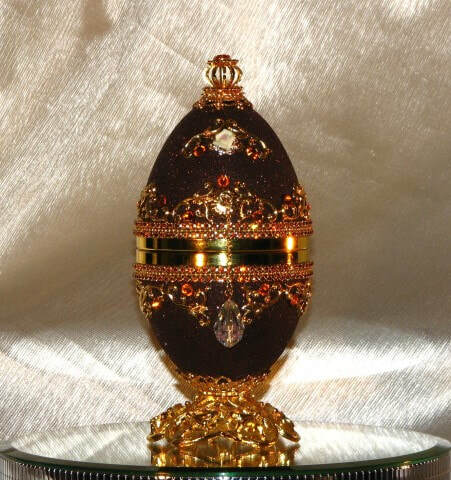 The inside of egg is lined with a cream satin fabric and finished with a lace border on the inside. 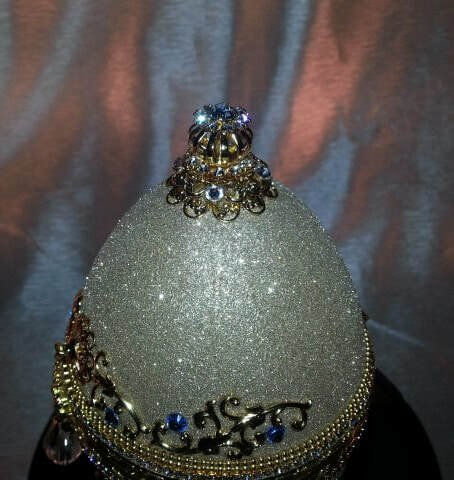 The design is finished with a crystal finial on top of the egg and a gold plated stand to support your egg.